Lelo in Nopo: Kale Chips: Hail to the Kale! Before you click away while saying "yecht!" to the thought of chips made from kale, just stop. Because you would be missing out on my new favorite snack. My new favorite snack that is so simple and good for you. With our weekly delivery of vegetables, we're getting kale every week. Kale, kale, and more kale. And I'm not complaining. I've come to love kale. It's a vegetable that's chock full of vitamins, and I'm working on the glitter river of '09 that says more to more things instead of less. So kale? Bring it on baby. I am not scared of you. But my secret weapon with kale is to turn them into potato chips. Except they are not potatoes, you don't deep fry them, and you don't add anything to the kale except olive oil, balsamic vinegar, and salt. Toss. Bake them in the oven at 400 for 10 minutes or so (watch them very carefully) and voila. You're done. 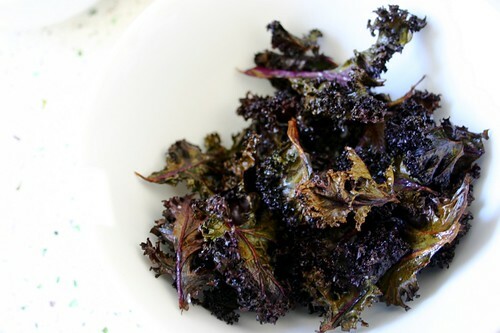 The kale turns into crisp, light airy snacks with the salty crunch of chips. 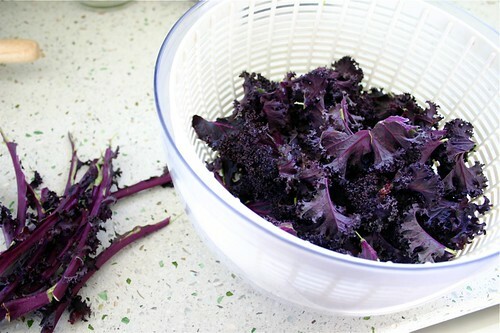 I've been using this beautiful purple kale, which can be hard to watch in the oven because you can't really tell when it's turning black and burning, but with green kale you could easily see the crisp factor. 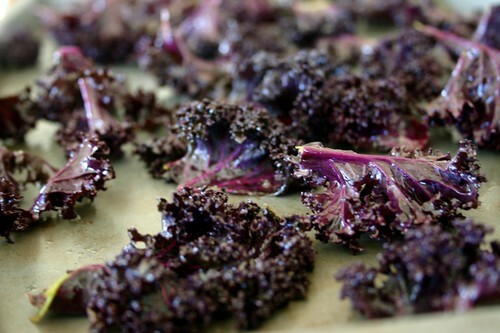 These purple/black crunchy kale chips are my new favorite snack. Trust me. You need to try these for yourself: you'll be surprised. Preheat oven to 400 degrees. Tear or cut the kale into 3 inch pieces. I don't use the thick center rib, but tear pieces away from it instead. In a large bowl, combine the olive oil, vinegar and salt. Toss the kale in the oil/vinegar mixture, coating the kale as much as possible. Spread kale in single layer on cookie sheet, and bake for 10 minutes, or until crisp. Sprinkle with additional salt if desired. I had previously heard a similar recipe from a friend and just hadn't gotten around to trying it. He swore by it as well, saying he ate it once a week or more. Thanks for reminding me! Thank you for your recipe...must try right away! I ordered some kale chips from somewhere just last week, but they aren't here yet. I have no doubt that I'll love them and probably love the homemade ones better. These look amazing! Thanks for the inspiration. Who do you use for your CSA and are you happy with it? oh my. That is brilliant! 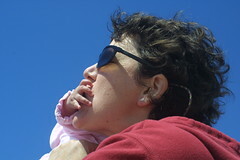 I had a non-stop kale-chip fiesta for a while last summer, and now my girlfriend is having one of her own...so yummy! and yea, healthy! You've got to be kidding me... How are you supposed to eat those with dip? or a piece of salami? cheddar cheese and mustard...??? No, no, no. Say no to the kale chips! Go back to the green smoothies! I'm not scared of kale, but I am a bit frightened of Swiss chard. I don't know if I've ever had it, even thought I guess it's similar to kale. I'll bet chard has shown up in your CSA box. Any great chard ideas? Personally, I like kale. These sound delicious and I'm going to try to make some this weekend. I still drool over those delicious brussel sprouts recipe that you posted several months ago. That is a personal favorite of mine! 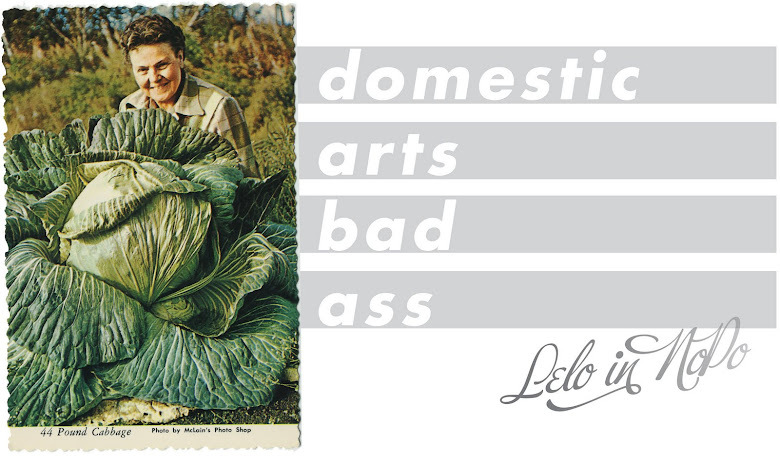 Hooray for more yumminess from the kitchen of Lelo. When I was deep into my raw food phase, I would make these in the dehydrator as opposed to the oven, in order to keep the enzymes all buzzy alive. Man, these are good. I've just been discovering kale. All these years I've been avoiding it. Who knew it was GOOD? I like this simple approach and I bet those chips taste great. I'll have to try them. we made these this afternoon and they are yummy even the 2 yr old likes them. Thanks for the great tip! Lelo, can one try this with collard greens? I love kale anyway, so I'm very excited to try your recipe. It sounds so delicious! !